Auraria is one of the safest campuses in the state, according to the Auraria Higher Education Center’s 2010 Security and Safety Report. This lack of crime can partly be attributed to the fact that no one lives on campus. “When you get people actually living in a certain area, whether it’s an apartment building or residential house, the conflict level does increase,” said Leonard Peete, Detective and Emergency Preparedness Coordinator for Auraria Police. Police also consider their responsiveness to reports of conflict a contributor to the low rate of violent crime. “When we get a report of a couple in a heated argument, we’re there. We’re usually there within a minute,” Peete said. Police try to mediate situations in which students are being disruptive in class and attempt to be sensitive to mental health issues. “When we have potentially violent situations with people who are demonstrating disturbing behavior and so forth, we have mechanisms within the institutions that we work with to try to mediate hostility,” Peete said. The police try to identify problems with students or people just hanging around campus and help the individuals in whatever ways possible before any criminal activity occurs. Although not mentioned in the 2010 safety report, theft on campus is a big problem, according to police. Bicycles and items from the bookstore are stolen from campus on a regular basis. Most of the time, the people stealing these possessions are not students and have addiction or mental health issues. “I zip tie my stuff so it’s a little harder to get off. 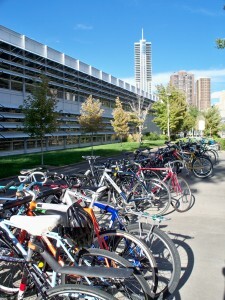 I chain my seat to my bike,” said Dawson, a Metro student when asked if he felt safe leaving his bike on a campus rack. Many students seem to feel that their possessions will be safe, despite theft problems on campus. “Hopefully I can feel safe. It’s the first time I’ve been here with my bike,’ said Todd, a Metro student as he locked up his bike. Recently there was a spike in locker theft in the gym and the classroom buildings. Police eventually apprehended the perpetrator who was a probation parolee that was living out of a locker and dating students. Motor vehicle thefts from Auraria are relatively low compared to other metropolitan areas. There were 17 auto thefts on campus in 2010 according to the safety report. “Considering we have 40,000 plus people who come here and this is a commuter campus and we have a lot of vehicles, I attribute the lower numbers for that to our proactiveness,” said Peete speaking about vehicle theft on campus. Police try to patrol the lots aggressively and make sure their sweeps aren’t routine so that potential thieves don’t know when they will be coming but experienced care thieves can be gone in less than a minute. Great article on a topic I have wondered about. Were you not able to get the student’s last names? Very well written. I like that you talked to someone at the bike rack about their bike – makes it a little more real. It’s nice to know that my time here at metro has been spent on a campus that is relatively safe. Nice article.